Today I’m showing some stuff from Zanzo. Not only does this shop have a good selection of skins, they have both separately sold jeans, shirts and jackets and all-inclusive outfits such as the one featured here. Kashima Ikemen includes a nicely textured striped hoodie on the jacket layer, featuring a scultped prim hood; two t-shirts in grey and brown (shown here); a pair of black jeans; and a white belt with grey stripes. The jacket appears hand drawn with good shading and detail. The prim hood is a little tricky to adjust, but looked okay with some rotation (could be shape-related). The jeans, bug-free and simple without cuff attachments (thank you! ), untorn with some mild scuffing and wear, are a good addition to an sl man’s wardrobe. The belt fits nicely with little adjustment if you have a smallish av. The t-shirts feature a splash of bright blue water with stylishly drawn colorful fish (you can see a tiny bit showing beneath the hoodie). I would like a shirt bottom on the underpants layer so I could wear the t-shirt alone without my av’s belly showing, or the t-shirt on the jacket layer to be worn untucked without the hoodie. 260L for jeans, two t-shirts, a hoodie and a belt, though, is quite a good deal! I’m showing here the Marshall skin, a very pleasant skin, also from Zanzo, that features (in the complete edition) 11 different facial options, most of which I have shown here in the second composite. Though this isn’t technically a skin post (I leave those to Ben! ), I wanted to give you the chance to see the wide range of options available when purchasing the complete set. It’s a handsome skin, I think, with well done details that I know are difficult to achieve in a skin (nice lips, and eyebrows that don’t look like caterpillars!). This skin has possibly the nicest collarbones I’ve seen on SL! 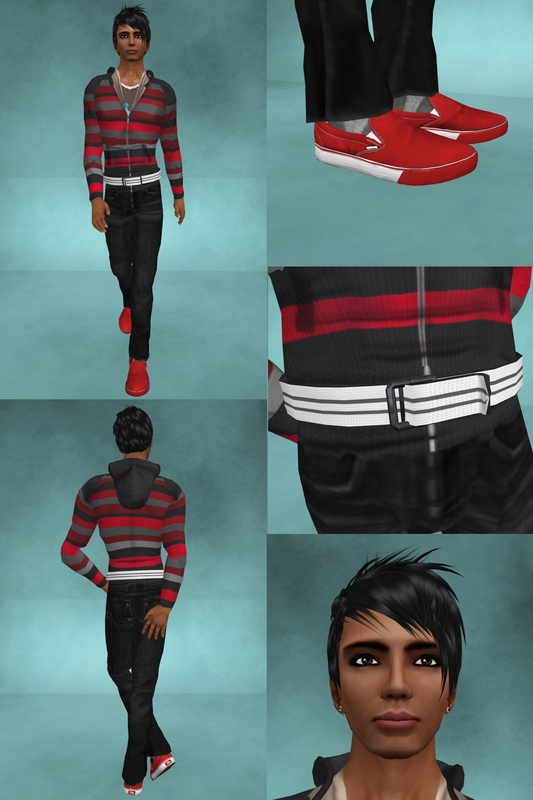 Finishing up this outfit today, I’m showing Akami (my current favorite hair) in Natural Black III, from Madesign, and the script resizeable and recolorable slip-ons from Hoorenbeek, and a platinum and black diamond, and platinum and ruby earring from Styles of edo. Good choice Perry! I like this stripped hoodie a lot. Nice post Perry, been to Zanzo a few weeks ago, and was suprised by the quality of the clothes also, Verry sharp textures, and lots of layers, and for a low price. I really like that skin on you Perry. Aww, the one with tears is so sad/cute. Yes it does have nice collar bone area. That hoodie is nice. Thank you, Beryl! It is a great hoodie, and you’re right about that skin being both sad and cute. Thanks for your comment!